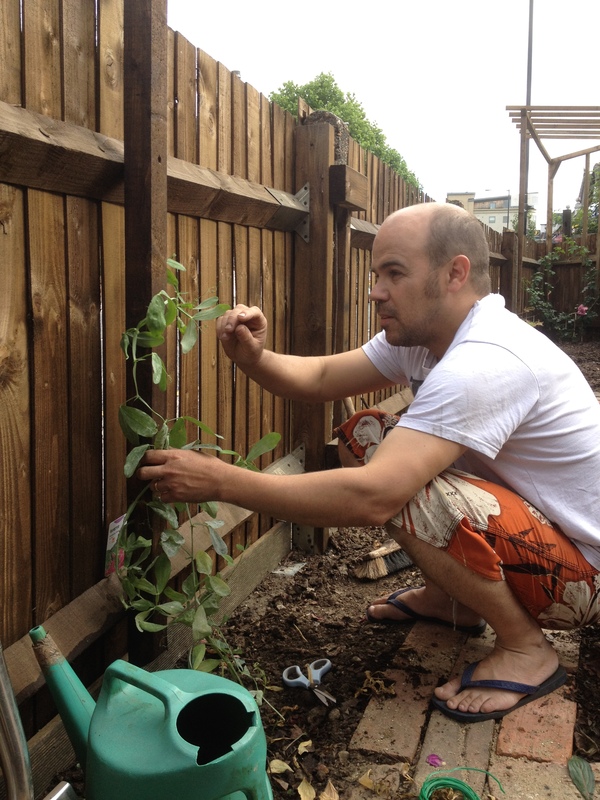 i had my eye on it a dozen years ago, back when the Stanley Gardens project was underway… at least plant a flowering fruit tree in the plot of waste land. NO was the answer – the then-landlord was a sour old Irish guy who paved the whole place, parked his car in the garden, surrounded the place with barbed wire and drenched everything in weed killer. it takes all kinds to make a world, they say, but for sure, some things passeth all understanding. well, old Mr Happy kicked the bucket and the property changed hands: time to try again. the initial research alst June consisted of ringing doorbells, trying to get a phone number for the new landlord. Eastern European woman – I’m sorry, I don’t know who is the landlord. DIfferent Eastern European Woman – I’m sorry, I don’t know who is the landlord. Yet a Different Eastern European Woman – I’m sorry, I don’t know who is the landlord. yet later, a fourth bell, and we strike gold: owl studio finds a new member, Americo from Brazil, wife Vivian from Portugal, and their tiny high wire act Anna Cecilia, who is two. another character for the studio circus. 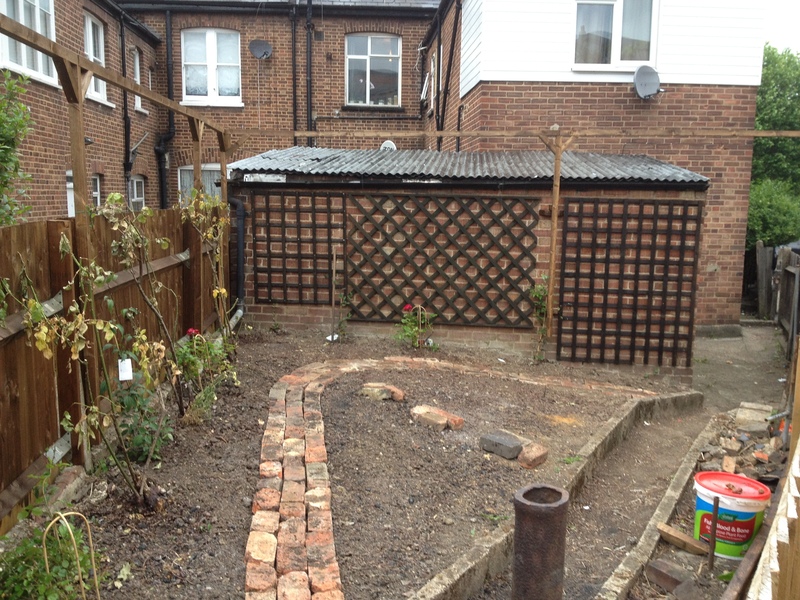 for a garden is a blank canvas for the artist. 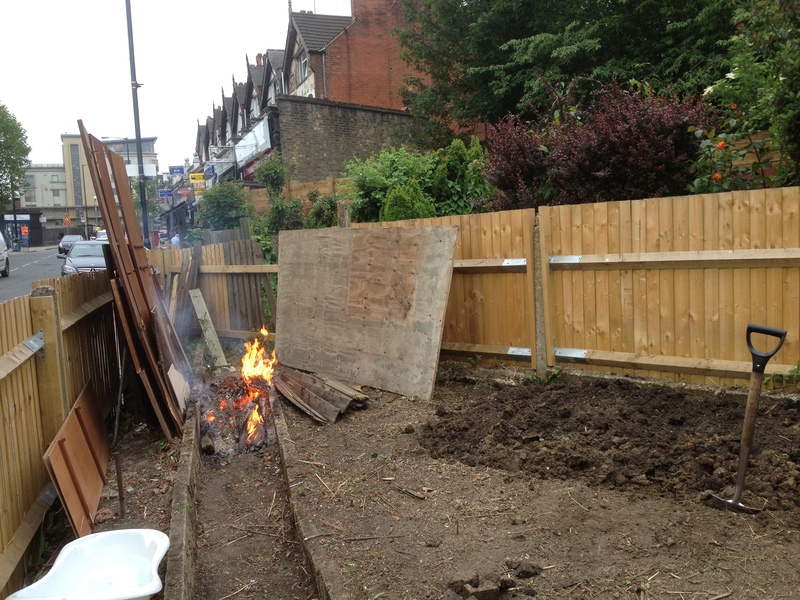 well, no one complained… though they might have, pretty quick… had i not snapped up that big sheet of wood to keep the flames away from the street once i realised how well the fire is going: ‘you’ve French-fried my child!’ – wind was taking the flames farther than i’d expected. still, all ends well, eventually. it took a full day of steadily feeding the fire to make a dent in the pile and it did leave a good heap of potash to dig into the soil. while waiting for the fire to burn, i filled bag after bag with bottles and litter… clearing the deck… down to the cement at least. dear saints above preserve us! CEMENT! 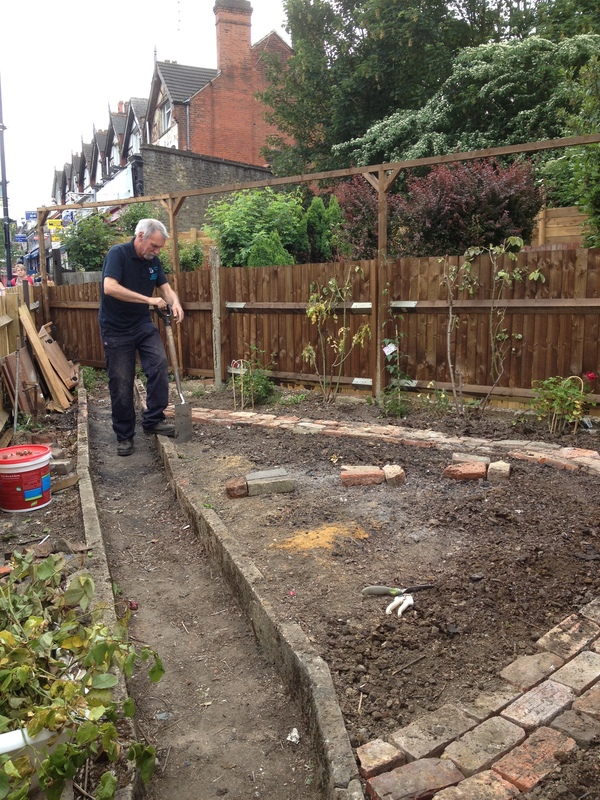 this appear to be some form of pathological disorder: ‘let’s pave the garden!’ one i’ve encountered before. 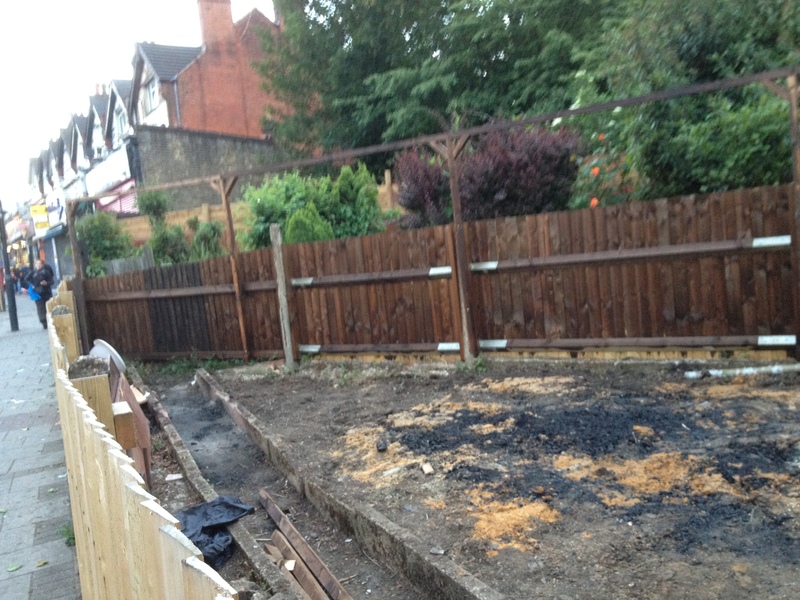 in all sad seriousness, i must have cleared away – HONESTLY – well north of two tonnes of concrete out of that little space. 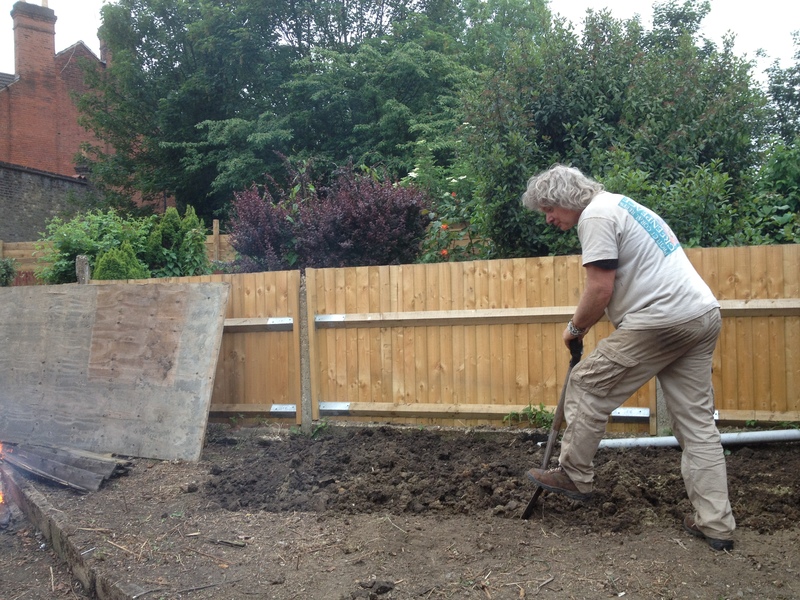 TWO TONNES OF CONCRETE – in a GARDEN… a small garden… eh?! 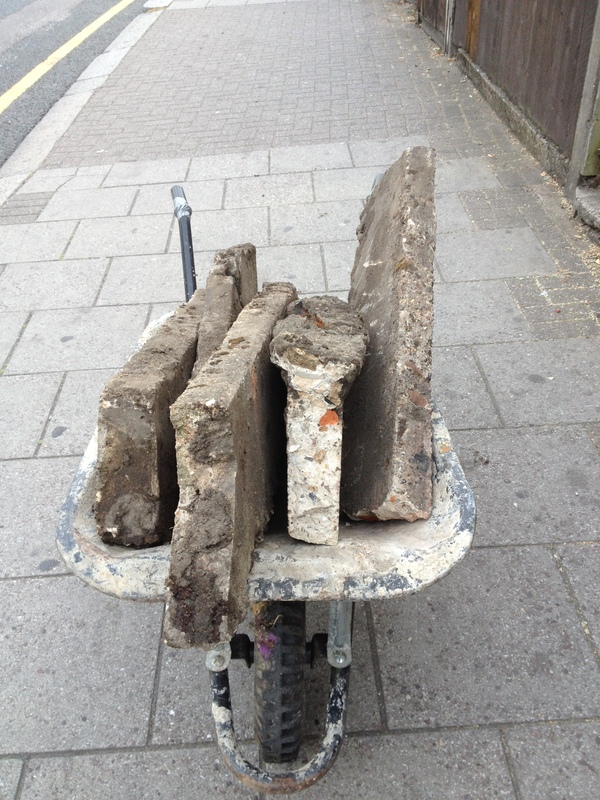 about fifteen wheelbarrow loads i jest not – check the photos. good muscle work like when i used to pump iron, ah, gardening, the well-rounded activity, much like carving in that respect – of course, i would describe creating a garden as a sculptural event: length, breadth, depth… colour… and allowing for growth: therein that wonderful element: Time. several salvaged sacks of sand (sibilant, non?) 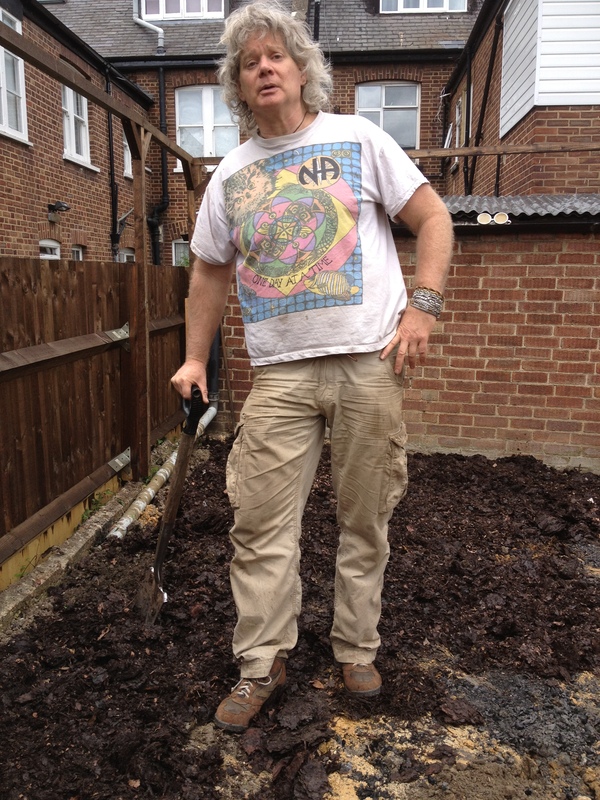 hurl a tub of bonemeal into the mix: can’t hurt, dig dig DIG… and, about a tonne of wonderful crumbly, well-rotted black leaf mould with earthworms even, courtesy of the local park, where owl studios did the carvings [link]: a friendly place. a resource. MAN: what a grand mix! makes it a pleasure to plant. 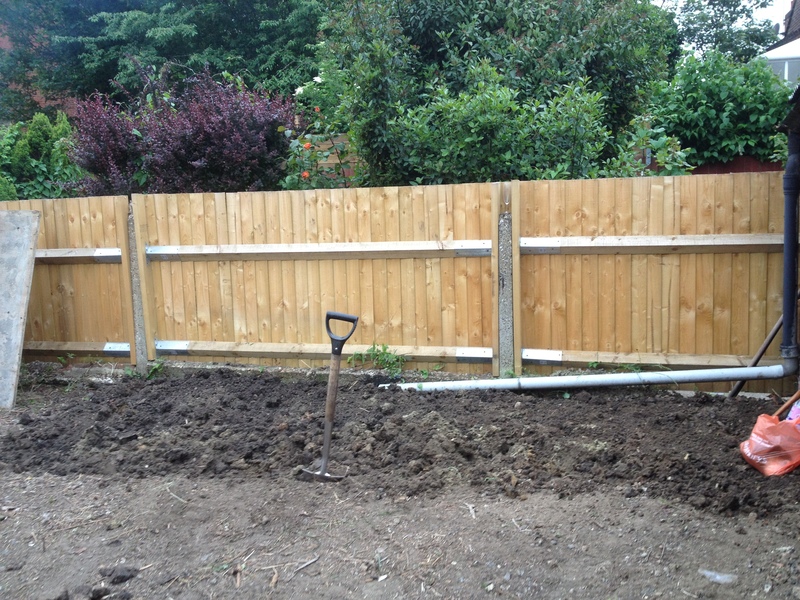 then the next step: lay out the garden path: sing ‘HEY! 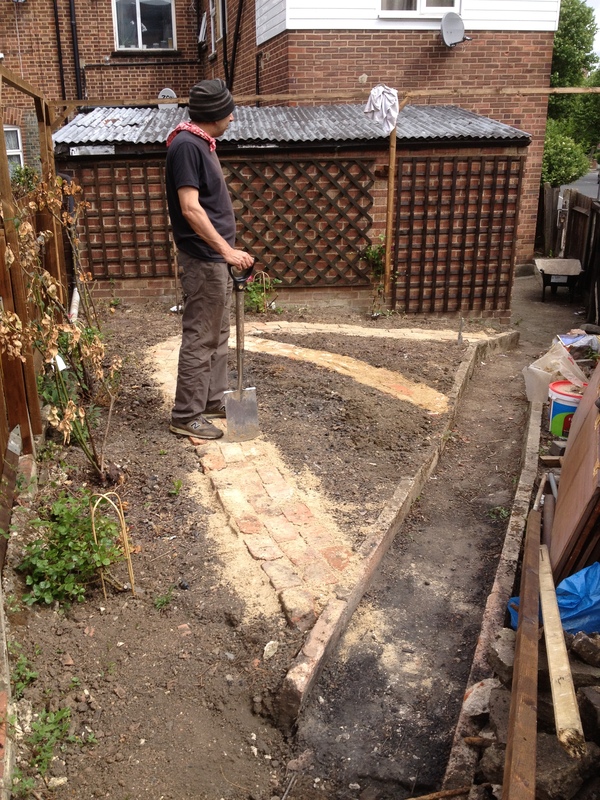 For the Yellow Brick Road’… well, terracotta… a theme of owl studio design… visit some old projects, salvage some dormant resources… bricks stacked in the corner of gardens, back in the stanley gardens project: Bricks Endure. the regularity of the brick in form and in tone gives a counterpoint to the writhing line and colour of the plants… puts me in mind of the Sir John Tenniel illustration for Alice through the Looking Glass [image]. arranged properly, with stepping-stone islands, you can walk all through the garden without stepping on plants or soil… as the sunlight bounces from the glowing bricks. the paths laid out, it’s time for part two of the skeleton, the bones of the piece, the woodwork. by making mistakes over past projects, this has now become second nature. a simple, stylised vocabulary of lines and angles in creosoted wood. 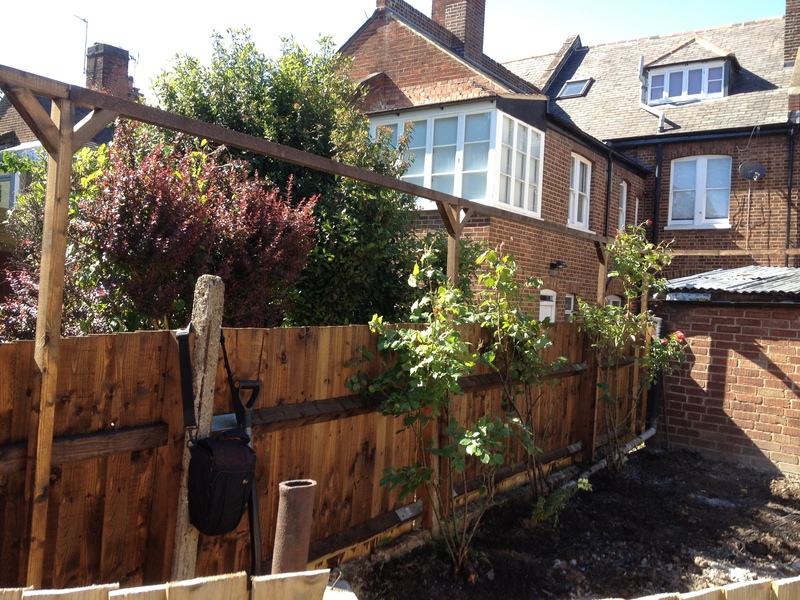 with the help of my trusty crew, Mark and Americo, we construct the climbing frames, the arches in each corner, the pergola, the strips along the fence… Pierre comes through with some salvaged trellis: perfect for hiding the fairly ugly raw brick wall at the side. everything is creosoted to bring it into the same tone, both the raw wood and the weathered. 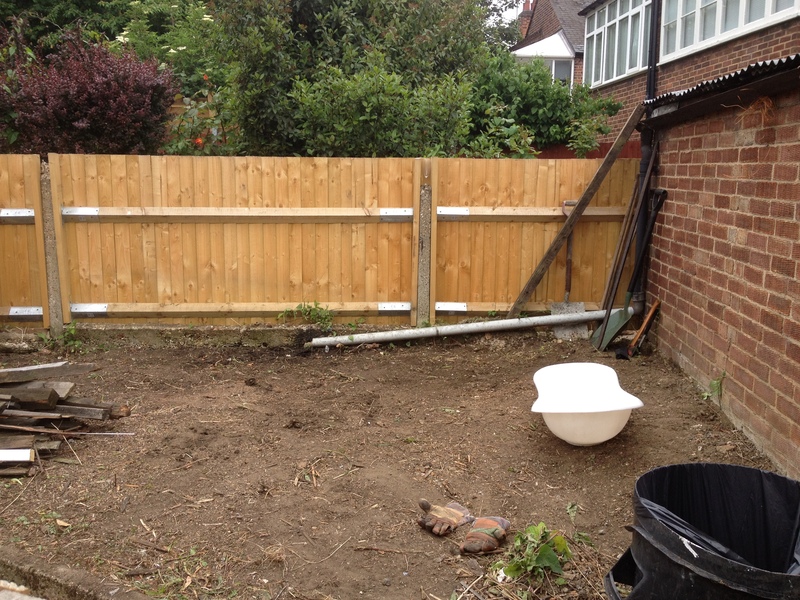 we even do the new fence on both sides. 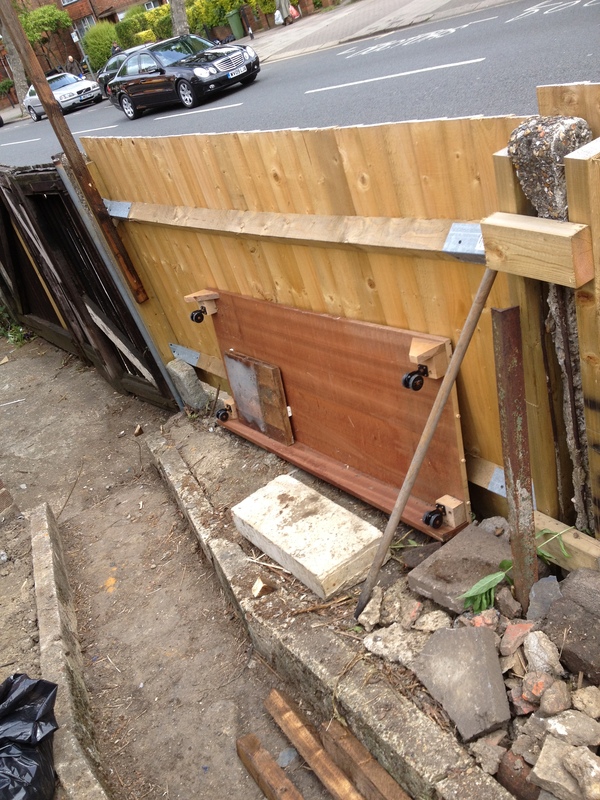 pull all the elements together… and finally, a matching gate for some degree of protection for our precious work, to round things off all neat and tidy. 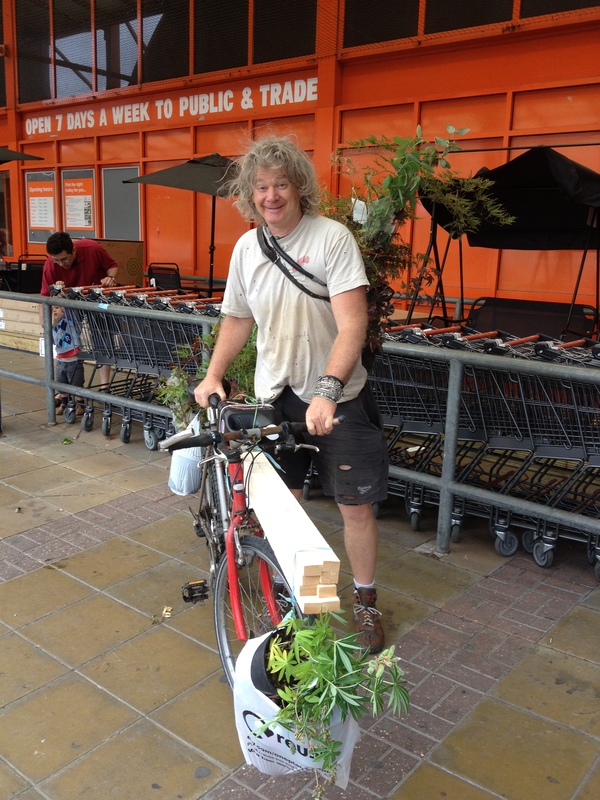 ever on the theme of recycling, clumps are uplifted and transplanted from previous salvage gardens… the local garden centre has loads of special end-of-season offer… neighbouring gardens make donations, seeds are sown. with particular attention to the periphery, the climbers, vines and shrubs: the greatest show of leaf and flower in any given space can be found in the vertical display. for the three corners of our plot, i abandon the ‘save money’ principle and buy the best rambling roses i can find… supposed to be 5-7m tall each, good heavens… should eventually turn out like the roses over owl studio. then clematis and honeysuckle to entwine through the roses, give colour in different seasons, and now for the short term, climbing beans. immediate, quick growth and colour for the here and now. works a treat! (Jack and the Magic Beanstalk got nothing on owl studio). this summer of 2013, after an unpromising start, has turned out to be Gardeners’ Delight: heat, sun, and rain thoughtfully arranged to arrive at night. and the Garden Prospers, amazingly so. the plants swarm up the trellis like speed freaks: wow… the whole thing from trash heap to finished piece was a bare month, WOW. and every time we’re in there pottering, every two minutes a passerby smiles over the fence and says, ‘really coming along!’ – ‘all in a day’s work, ma’am,’ i reply. as summer winds down, it’s time to plant some bulbs, time capsules for future flower… Pierre-the-Gardener advises first laying down a good bed of grit for drainage so that the bulbs will flourish rather than rot… so more digging to come. the signature of the garden, of course. … with more planned, as Time and Energy catch up with Fantasy and Creative Visualisation. the Fantasy being, of course, to have various carvings peeking out through the flowers, even as in Alice in Wonderland: a sculpture garden, in a minor key, for owl art studio, here on the High Street of Our Neighbourhood, Willesden Green, just around the corner from the studio proper. That is beautiful- awesome work!